Most real estate investors start off investing in single family homes which is a comfort everyone is familiar with since we all live in a home and not a commercial property. With a residential home investment your return on investment diminishes when bought at a higher price because the rental income (your return) is too low to justify the price. Here is Phoenix the the cut off is approximately $200,000. Also, if your tenant moves out then you are stuck with a few months of paying the mortgage before you locate a new tenant. With a commercial property investment your return on investment is higher because you have multiple units rented that justifies the price paid. Also, since you have multiple units a tenant moving out will not effect you financing because the other units are still generating income to pay the mortgage. 1) Rate of Return = The percentage return on each dollar invested. Also known as yield. Calculated by taking cash investment divided by total purchase price. 2) Net Operating Income = The rental income minus total expense. 3) Annual Debt Service = Expense of a mortgage including principal and interest. 4) Initial Investment = The sales price plus acquisition costs less the amount of the mortgage loan is the down payment. 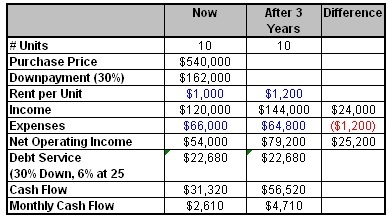 5) Cash Flow Before Taxes (CFBT) = The net operating income (NOI) less the annual debt service equals cash flow before taxes. 6) Equity = The value of one’s interest in the property consisting of fair market value less any outstanding debt or other encumbrances. 7) Cash-on-Cash Return = Calculated as cash flow before taxes (CFBT) divided by the initial investment or down payment. 8) Cap Rate = The cap rate is basically the return on investment from the property without considering financing. It’s the net operating income divided by the purchase price. These are basic terms any investor should understand before purchasing a commercial property. The professionals at Position Realty can help you with determining which properties offer the best return on investment. We have development proprietary spreadsheets used to successfully analysis commercial investment opportunities. If you are thinking about purchasing a commercial investment property give us a call since we will give you honest and accurate feedback regarding which property to buy. We specialize in helping small to medium size investors reach their investment goals. These 10 rules might seem elementary at first glance, but you’d be surprised at how many of the 10 rules are REGULARLY broken by real estate investors every day. With the, so called, gurus around the country preaching “more”, “bigger” and “quicker”, new real estate investors have gotten themselves into trouble by not following sound business principles outlined in this tip. With commercial real estate professionals always on the go, the advancement in mobile apps has helped many professionals meet more people and close more deals. While new mobile apps have been slow to reach the commercial real estate industry, it has really taken off in the last year or so. Recently, I came across a website, run by top commercial real estate professionals, that has reviews on the most popular commercial real estate mobile apps. The name of the site is CRE Apps. You can check out their website by going to cre-apps.com. CRE Apps is a great place to learn about all the new CRE apps that are helping people like you and me to make their business easier and more convenient. Here’s where you can find out the most popular CRE Apps: www.cre-apps.com/2012/04/most-used-cre-apps/. These real estate investing mobile apps are great in helping you find and close profitable commercial real estate deals. I’ve created a Top 10 list to use as a guide when researching properties on these mobile apps. Real estate investing is a long term game. Make good business decisions using these 10 rules as a guideline so that you can have long term success with your investment business. Focus on buying GREAT deals not big deals.With time, big deals will come. Whether you are a real estate investor, broker, manager, lender, consultant or contractor, you should spend some time learning about new technology that can help grow your business, and, make life a little bit easier. I hope this tip serves you. I look forward to it helping you reach finding and buying great commercial deals. We all work hard at our J.O.B., don’t we? We work hard each day and hope to retire when we’re 65, that’s the American dream, right? Many of us are looking for something better, maybe a scenario where we can retire earlier or perhaps enter a state of semi-retirement. The answer: investing in commercial real estate. Imagine working really hard to find a good building at a fair price, putting the financing together, and hiring a property manager to run the whole thing. Was that a lot of work? Of course. But don’t you work hard anyway? Here’s the difference…. Commercial Ownership – What’s It Really Like? Imagine the day you close on the building and your property manager takes over. Ask most commercial building owners, and they will say they spend anywhere between 2 and 5 hours per week on their building if it’s managed by a professional management company. What have you done? You went from a job that took 40-50 hours of your time each week to one that takes a fraction of that. And you replaced part or all of the income of your job with that from the commercial building. You’re working less while maintaining your income. What would this mean to you? Maybe you could spend more time with your family. Maybe you want to travel more. Pursue a hobby. Give back. Or maybe do more deals. How is something like this possible with commercial buildings? The answer is in how commercial buildings are valued. How Do you Make Money On Commercial Investments? The value of a commercial building is driven by its net operating income, the amount of income left after all expenses are paid. The more money the building spits out after all expenses, the more it’s worth. In many parts of the country, a building is worth 10 times its net operating income. This “10 times multiplier” is referred to as the “capitalization” or “cap rate” for short. Don’t worry about this for now – it’s not important to the point I’m trying to make. Let’s just use a cap rate of 10 for our discussion. Let’s say a building has a net operating income of $100,000, which would make it worth $1M. If you could somehow make the building generate $10,000 more each year, maybe by increasing rents or decreasing expenses, you would have generated $100,000 in value (a cap rate of 10 times the additional income of $10,000 is an additional $100,000 in value). Let’s look at a more specific example, so that you can start visualizing how this “math” could work for you in real life. Assume you bought a 10-unit building for $540,000, and you had to put 30% down. The building was bought at a “10-cap” based on our formula we’ve used so far. Which means its net operating income (or NOI) is $54,000 per year, times our cap rate of 10 is $540,000. The income per unit is $1,000, and the expenses are 55% of the income. The building is in great shape and has been managed by the owner himself. So far there is nothing special about this deal. However, suppose you found out that the average market rent in the area is actually a $200 higher per month. Suppose further that you meet a property manager who manages two similar buildings in the area, and he tells you that his expenses are only 45% of income. By making small improvements each year, we have added $25,000 to our Net Operating Income. What is our value now? Our new NOI is $79,000, so our value now is about $790,000 ! That is an increase of $250,000 in three years! Isn’t that incredible? You also had between $2,600 and $4,700 in monthly income from this building over those three years. That’s still not all. You (emm, I mean your tenants), paid down $21,500 of your mortgage balance during that time, too. Your down payment was $160,000, and your total profit if you sold this building in 3 years is $284,000. This means you nearly doubled your investment! In the meantime you enjoyed an average of $3,500 per month in cash flow. Maybe you need more than that each month to quit your job. No problem. Buy a bigger building. Or get a second or third one. Three of these buildings will give you $10,000 per month in income and almost a $1M of profit in 3-5 years. Retirement Possible In 5 years After Investing In Commercial Real Estate? Would it be a lot of work? Absolutely. Do you work pretty hard right now? Probably. Imagine working just as hard for the next 5 years and being able to retire. Imagine. 5 years. And then you can do whatever you want. Keep working. Keep finding new deals (why stop?). Travel. Family. Give back. Whatever. You don’t have all the answers, and you probably feel overwhelmed. That’s to be expected. The point I’m trying to make is, make sure that whatever you’re working hard at gets you to where you want to go. Give the professionals at Position Realty a call to discuss your investment goals and objectives. Most real estate investors get started buying single-family houses, probably because it’s what we’re the most familiar with. But whether you’re going straight to the big time or are ready to advance from houses to larger (and more profitable) deals, here are 10 time-tested guidelines to follow that will help you have more success. Commercial deals take longer than single-family houses do. They take longer to purchase, renovate, and get sold. This is not necessarily a bad thing, but something to keep in mind so that you don’t get impatient or rush into a bad decision. Think of commercial deals as big bonuses or your retirement vehicle, not a way to create quick cash to pay the bills. There’s nothing wrong with investing in residential apartments per se. I’m just pointing out that since most investors are already comfortable with residential property, they tend to look for apartments without considering the other types of commercial property, such as office buildings, industrial, mobile home parks, land, etc. Weigh all of these property types and choose your own niche based on whatever will help you reach your unique goals, regardless of your comfort zone. Fight the temptation to get discouraged if you haven’t done your first deal yet, or if you are spending more time per deal than your previous ones. Houses are so similar that it’s easy to make a cookie-cutter system for buying and selling them. When I begn looking for commercial properties, I was surprised at how long it took me in the beginning to screen deals and make offers. Just remember that there is a learning curve, like with anything else, and that things will go faster over time. If you’re buying houses, you may use certain formulas, like buying at 75% of After-Repaired Value, minus estimated repairs. Commercial property will have new and different formulas to get used to, such as Net Operating Income and Cap Rates. Learn what is considered good in your area and get familiar with them when making offers. Relationships with other investors and private lenders are important when buying houses, but they are even moreso when buying commercial properties. For one, properties costing a million dollars or more are probably within the financial wherewithal of most of us individually, so you probably have no choice but to get to know and work with partners. Also, many commercial properties are sold without being listing first, so the more people in your network who know what you’re looking for, the more deals you’ll find. Commercial loans are a different animal than residential loans, and in some ways better. The down payments needed are usually a higher percentage than loans on single-family houses, which means you’ll have to put more down (or get your partner to put more down). However, there is often no personal liability if the deal goes south, and they are more lenient about letting you borrow the down payment money from someone else. Nevertheless, before making offers, ask around and find out who the best lenders are in your area to use when buying commercial properties, as it may make the difference between qualifying for one or not. After your offer is accepted, you have a period of time (just like with houses) to do your due diligence. You should get an appraisal, property inspection, and other tests and inspections required by law. The only problem is that these cost a lot more than they do for smaller deals. You might spend $5,000-10,000 on a deal, only to find out you don’t want to buy it after all. While this is always better than buying a bad deal, you should still be prepared for these kinds of expenses. As I said before, buying million-dollar properties is not something most people can qualify for on their own (in fact, getting a loan to buy a house is hard enough!) So make sure that you spend a lot of time finding private lenders or deal partners to help you out. A partner can provide the cash and/or credit needed to purchase a property, and you can compensate them by paying a fixed interest rate or a percentage of the cash flow or proceeds from the sale. Lastly, it’s imperative that you associate with experienced commercial investors who can answer questions that come up while you are evaluating properties. There’s no sense in losing a deal or buying a bad property because you didn’t understand certain environmental regulations or estimating what trash collection really costs. Know who you can ask to get fast answers when you need them, and make them your new best friends. By following these guidelines I can’t promise instant success. However, you will have the right perspective about investing in commercial property that will help you start right and stick with it for the long haul. Good luck to you in “moving on up” from single-family houses to the big time. Apartment properties are preferred by many investors as they bring in passive income (and its my favorite type of deals to do!). When buying apartments, it is normally a longer-term investment, but you need to make sure your money is used in the right place. Below are a few factors that may help in deciding which property to invest in. One should always choose a rental property they will be able to afford; it’s not just about being able to buy a piece of land. Investors calculate that the rent will be able to payoff the debt of the loan and provide extra money at the end of the month for their own pockets. Until a unit is rented out, the owner (that’s you!) has to pay the mortgage, so he or she should have enough monthly income to settle the payment. Apart from the mortgage, other expenses also need to be fished out from the owner’s pocket. One should have enough funds raised so an investment does not end up in a loss. A good neighborhood ensures how soon a property goes on rent. As an investor, one should purchase a property in a safe and reputable neighborhood. Neighborhoods are generally categorized into A, A-,B+, B, B-, etc. properties Properties near colleges go on rent easily, as every season students enroll and they look for a cheap residence. The surroundings of the property should have all the basic amenities like schools, parks, shopping malls, supermarkets and so on. A property that is far away from these basic requirements might not be able to hold tenants for long. Get know-how of the area, and before signing the deal, visit the area for a few days and at different times. This way one will get to know about the area and the crowd that lives there. Getting information from those who already live there will be a deciding factor in the purchase. Your job as a real estate “rainmaker” is to find the deal and make it happen. Leave the building management and operations to others. The big money is made in the deal and that’s where your time is best spent. Obviously you want to focus only on stellar deals. Forget the marginal ones. It takes just as much time to work on a deal that brings in peanuts as it does to lock down a deal that makes you wildly rich. There are 6 red flags that tell you quickly if a deal will be a time-waster. If you spot just one of these 6 warning signs, move on to the next potential property. The bottom line is you want to make a lot of money. If the numbers don’t add up and the seller won’t drop the price, or you can’t get better terms, move on. If the seller can’t provide you with the year-to-date profit and loss statements, plus the actual numbers from the previous two years, move on to another deal. Pro forma numbers are pure guesswork. They may be educated guesswork, but they are still a projection. Lenders won’t give these made-up numbers any weight and neither should you. A property may look good on paper: The numbers are real and they add up. But a site visit paints a different picture. Major repairs are needed because the seller has been deferring the maintenance hoping to pass the headache on to the buyer. Don’t let it be you. Don’t spend your money trying to reverse a trend. If the neighborhood is in decline, the property carries that stigma. Tenants will be moving on, and so should you. 6. Months on the Market. Good properties go fast. Bad properties linger in the listings for month after month. With detective work you can figure out why it’s a dud. And that’s a viable learning experience. But your time will be better spent going after good deals. You create a beautiful garden by getting rid of the weeds. It’s the same with building a real estate portfolio: you must quickly weed out the lousy candidates and focus only on the prime properties. I was asked the other day by a new investor what is the best type of commercial property is to invest in. I like apartment buildings best. They are easy to find, easy to analyze, everyone needs a place to live, banks love to lend on them, and they’re great cash flow generators – especially now that prices and interest rates are down! In fact right now FNMA is offering 5.5% loans on apartment buildings! For a new investor they are easy to analyze, manage, and easy to relate to. For an experienced investor they are straightforward to manage and you can set up business systems to automate and delegate the mundane day-to-day tasks of owning apartment buildings. Once one is started it is relatively simple to buy more and more apartment units and become a rich apartment building mogul. Now is a great time to start. There are lots of great deals on apartment buildings because the renter pool is substantial due to foreclosures and prices are going up. My advice to my new investor is to start off with apartment buildings. I recommended that to start by investing in small to medium-sized multi-unit properties (5 to 12 units) then work your way up to larger properties as you gained experience and a strong management team. The quickest way I know to make significant profits with commercial real estate is to do deals with substantial upside potential. But first let’s define “upside”. I’m not talking about a paper increase in value due to scheduled rental increases, or replacing “below-market” leases, as many for-sale brochures define the term. My definition of upside is to unlock hidden potential in a property that creates triple digit percentage gains on investment, provides positive cash flow along the way, and avoids major risks of loss. The upside may come from expansion, redevelopment, or by changing the market position of the property with major improvements. It boils down to three critical factors: the local market conditions; good structural bones; and a willing seller. When all three are present the deal is there for the taking, but only if the investor can design and implement the proper structure. The focus of this discussion will be in creating a structure to create and capture upside. First and foremost is the local market. Regardless of property type, the first rule of real estate investing is we do not make markets—we serve them. A poor market will stop any plan dead in its tracks, so the first priority for any strategy is make sure the area demographics of population, income and employment are in a positive trend. Basic demographic research includes statistics for a three- to five-year period to show the trends. One year’s data is useless. To say a market had a 2% population growth in the previous year means nothing. But if the current 2% increase is up from 5% loss over the last five years indicates the market is turning and worthy of further investigation. With that knowledge we can be confident in seeking out the worst property we can find in a good location, because that’s where we’ll make the most money. What we’re looking for is the things that can’t be changed being sound. We look beyond the cosmetics to the structural elements, such as foundations and basic construction of the buildings, the systems, and the grounds. If the structural elements are failing, then the property may not be suitable for turnaround without expending more funds than can be recovered. Aesthetics can be fixed. Unless you are an expert in building systems, construction and environmental issues it is advisable to hire experts to inspect the relevant elements of the property. The cost is negligible when compared to the cost of fixing a mistake, or worse, not being able to fix it. Location is something else that can’t be changed. Don’t fall for the old sales line of “priced below replacement cost”. My first question is always “If given the chance to replace it, would I?” Understand the local market and how it works. A great deal in a bad location is not a deal… it’s a problem looking for an owner. The final question is to assess the seller’s willingness to help us solve his problem. There are a number of ways to accomplish that, and it takes some digging to get into the seller’s mind and discover his true motivations. Most commonly the property has existing debt. The seller may offer to finance part of the purchase price as a second mortgage. But the property can rarely support a new loan, and that requires the buyer to fund improvements from cash out-of-pocket. That’s hardly an attractive proposition, as the cash flow is usually not sufficient to carry the additional debt of the seller’s note and provide a return on the investor’s capital. Typically the alternative is for the seller to greatly reduce the price, even below the amount of current debt, or accept a subordinated note with no payments. With those options many sellers will opt to keep the property rather than take the risk for no money. The deal falls apart for lack of an alternative structure. The ideal structure would allow the investor to obtain new financing that includes the funds needed for improvements, the seller to realize some of the upside in return for staying in the deal, and designed so the property produces a positive cash flow. Can that be done? Yes it can, as the following example from my files demonstrates. The deal was a 54-Unit apartment complex, well-located in a great college-town market. The owner had let the property decline to the point that the performance had suffered tremendously. The expenses were high and the income unstable due to the poor condition of the property. The buildings needed new roofs, windows, kitchens, paving, heat pumps and new appliances. The existing NOI (net operating income) was about $145,000. The owner had existing debt of $950,000. The improvements were estimated to cost $350,000. The as-is appraised value (and the asking price) was $1,200,000, reflecting an as-is 12% cap rate. The projected value after the improvements was estimated to be $1,750,000, using the same NOI but a lower cap rate (8%) to reflect the completion of the capital improvements. We came up with the following deal structure: In lieu of down payment, the seller would get 20% equity-only (not profits) interest in a new LLC that would acquire the property. The LLC would obtain a bridge loan for $1,300,000 to pay off existing mortgage and fund the repairs. Our investment plan was to complete the improvements over a six-month time frame, and then raise the rents to market levels. In the first year we planned to complete the improvements and raise the rents for upcoming leasing season. No occupancy increases were projected, but the combination of higher rents and lower expenses were projected to significantly increase the NOI and cash flow. In the next two years it was expected that the occupancy would also rise to an average 97%, excluding collection and vacancy loss, further increasing NOI and cash flow. In the third year the LLC would refinance the property based on the increased income, and use the proceeds to pay off the seller’s LLC interest. At that point we would own 100% of the LLC interests and could either hold the property or sell at will. The improvements were completed and the rents were raised $50-$75 per unit in the 1st year. Annual increases of $20 per unit were implemented in following two years. The occupancy increased from 90% to 98%, raising the NOI to almost $190,000, and the cash flow to $80,000. Now it was time to turn on the money pump. The property was refinanced with a $1,500,000 loan based on the higher value. We used $200,000 of the proceeds to pay off the seller’s interest and the LLC kept about $50,000. The loan was at a lower rate and longer amortization, so the cash flow actually increased to about $90,000. We held the property for two more years, and then sold it at a 7.6% cap rate on the next year’s projected net operating income of $186,200, yielding a price of $2,450,000. If you were paying close attention, you realize now that the deal was done with no money out-of-pocket from the buyer, but with none of the risks of over-leverage. After location, zoning is probably the most important characteristic of any type of real estate. It is the obvious starting point for evaluating a parcel’s potential for development because it spells out what you can do with the property. Zoning is a critical piece of the puzzle particularly if you want to be a land developer, an investor or work with a builder in some way. Save yourself much time, energy and frustration by checking out the zoning first, not last. Local governments enact zoning ordinances and adopt the maps that show the physical boundaries of the zoning districts, and these are modified periodically. 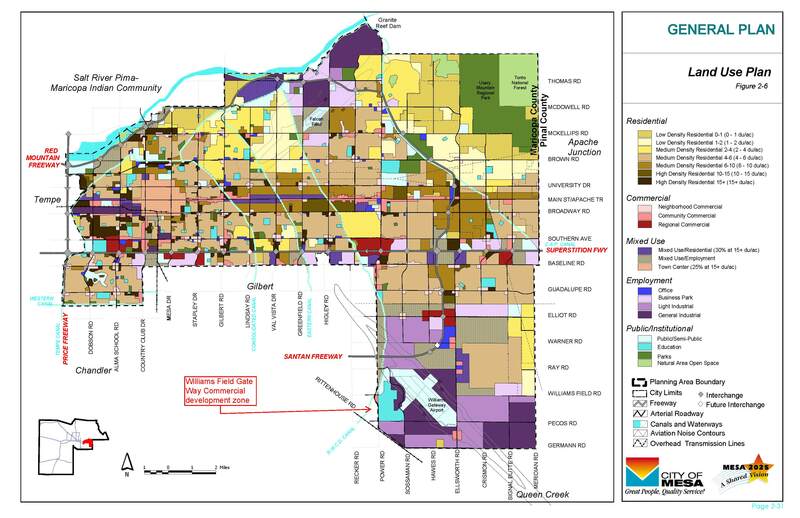 To determine the current zoning of a particular property, you would first look at the zoning map to see what district it falls in and then consult the current zoning ordinance. Both of these documents are available for review online or purchase at the municipal building. What will you find in the ordinance? It tells you what land uses are permitted in each district or classification. These classifications generally include residential, mixed residential, mobile home, commercial, shopping center industrial, office, and conservation. The ordinance also lays out other standards and requirements, such as the minimum lot size, minimum lot width, dimension of setbacks, height restrictions and building coverage. It contains definitions that help you understand the terminology used throughout the ordinance. There are general provisions that apply to every zoning district, and these deal with issues like non-conforming properties and uses, accessory structures and uses, flag lots, fencing, signage and minimum lot frontage requirements. Provisions for a specific zoning district can often include both “by right” and “conditional” uses. For example, single-family detached dwellings, agricultural uses and governmental recreation areas may be permitted in a district. A privately-owned riding academy, stable for horses, public or private day schools, 18 hole golf courses, places of worship and day care facilities are permitted in that district only when authorized by the municipal Zoning Hearing Board as a special exception. This latter group of uses is not permitted automatically, and to get a special exception, you would have to demonstrate that your use falls within those defined in the ordinance and also complies with any requirements, such as minimum site area, building and paving coverage, and buffering, specific to that conditional use. It would be helpful to remember some key points about zoning. Land use and regulation laws vary from state to state. Terminology and nomenclature vary from municipality to municipality, even within the same county in the same state. For instance, the “R-2” zoning classification in one municipality may mean that single-family detached housing is permitted on a minimum lot area of 35,000 sq. ft., with a lot width of at least 125 feet, and front, side and rear setbacks (yards measured from the parcel boundaries to define the area where a structure can be built) of 60, 20 and 80 feet, respectively. Go to another municipality, and you could find that the R-2 District permits single-family detached housing on 43,560 sq. ft. lots 150 ft. wide with front, side and rear setbacks of 60, 25 and 80 feet. You should not assume that the same name used for a classification in different municipalities means the same thing and when marketing land to potential buyers, be sure to include information on the permitted use and requirements for minimum lot size and width. Describing the zoning of the property only as “R-5”, “MR-1” or “C-2” is meaningless. Finally, some words of caution. Zoning and other types of ordinances are available online. Do not, I repeat, do not rely exclusively on online ordinance information. Go to the primary source (the municipality that enacted the ordinance) and check it out to be sure you have the most current and accurate information. Always page through the entire ordinance because municipalities often enact amendments that can be printed in the back of the original ordinance (without cross-referencing the original provisions that have been amended). If the provision is somewhere in the ordinance, it applied. Just because you didn’t see it doesn’t mean that it doesn’t apply. Are commercial fixer-uppers worth the time, expense and effort? My answer to that would be that the right fixer-upper with numbers that make sense can be the right strategy to use. In fact, these types of properties can be an easy way to see an instant value increase in the property but like with any deal, only if the costs to rehab the property make sense. Commercial fixer-uppers employ one of my favorite value plays called “repositioning”. That means that either the tenant base changes, the appearance of the property changes or that both of these options are exercised on the properties. In residential real estate investments, the idea of investing in a fixer-upper is to acquire the property at a significant discount due its condition. In commercial property, the same still holds true but in commercial properties it can account for greater cash-on-cash returns. Perhaps you’ve found a property that needs some cosmetic care. Maybe the exterior needs to be updated with a new look. You’ll be amazed at how a small investment can net a high return in value. Apartment buildings can be a great opportunity for repositioning. In strategies like these, the first thing I usually change is the exterior paying special attention to the parking lot, roofing and sidings. I do other simple things like updating the landscaping and putting new signage on the property which are quick ways to give a new appearance to an older building. I might also consider repositioning the tenant base with this same apartment building. I’ll replace tenants who don’t pay or don’t fit the target tenant profile with ones that do. This may take months to accomplish, but the increase in value can put the worth of the property through the roof! When repositioning a commercial property, make sure you keep on top of excessive rehab costs. Have a plan and get estimates upfront. The lack of a rehab plan can cost thousands of dollars to fix especially if the rehab doesn’t produce the results you desire. Remember to also use professionals to get the job done. Trying to be cheap by doing it yourself may mean that you don’t end up with the professional upgrading that your property needs. This will not only waste your time, it’ll cost you the tenants or your building. A lot money in the deal to help cover the expenses of repositioning. Taking too long to get paid is one of the reasons a fixer-upper investment will fail. If you aren’t collecting the necessary rents to cover the mortgage because repositioning is taking longer than expected, you could have a disastrous situation on your hands. Set a plan that is realistic financially before you commit yourself to any fixer-upper deal. Commercial fixer-uppers may also be candidates for using a value strategy called “forced appreciation’. This means that property appreciation occurred because rents were raised or expenses were lowered. Was the previous owner afraid to raise rents because he felt the property was in disrepair? Did the property have expenses on the higher side and what will it take to lower the costs? Simple fixes to problems like these can increase the net operating income and the overall property value. Get rid of your fears about working with commercial fixer-upper properties. By using sound strategies such as repositioning or forced appreciation, you can ensure that your investment will be a success.